Below you will find four important tips on how to communicate hurt to your partner. Start by picking the right time to have tough conversations. Avoid the snide remark at the dinner party or the passive aggressive comment in front of your in-laws. Acknowledge the raw pain you are feeling to yourself and take a quick break from everyone else, or at least note to yourself what triggered the need to lash out. I like to call this “Pressing the Pause Button.” Bookmark this in your mind to return to later. Painful emotions can be helpful in uncovering a negative cycle in your relationship. Recognize the pattern of previous explosive conversations. Think about how these conversations usually go. Do you throw word bombs at your partner and leave the room? Do you tend to talk your partner into a corner? Maybe you are the one who avoids the conversation altogether just to keep the peace. Look at the cycle that you return to and resolve to yourself not to engage in that particular behavior. Keep your voice soft and your mind open. Vulnerability is a terrifying but necessary component when you communicate hurt to your partner. Prepare yourself to hear your partner’s side as well; there are probably other emotions and perceptions on the other side of this issue. 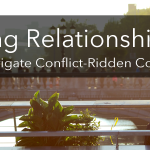 Get on the same page with your partner before launching into the conflict. When you get permission from your partner to have a tough conversation, you are getting their “buy-in” to work on a problem together. This starts you out on the same team instead of opposing sides. Ask, “Can we talk about that conversation at your mom’s house?” Your partner may not be ready to have this conversation — if not, ask when would be a better time and emphasize to them that you want to respect them but it is important to you to know when this will be addressed. If your partner agrees to have the conversation, you are well on your way but take it a step further, “I realize that these conversations often end in arguments with me calling you names and you shutting me out. It’s important to me that we try to have this conversation differently. What do you think?” When you get ready to communicate hurt to your partner they hurt you, think about the way that you would want to be spoken to and times in the past when they have communicated how to best approach them. Use emotion words as much as possible and the word “you” as little as possible. Of course, this is all easier said than done. It takes a lot of work just to get through part one, much less through every step without slipping. One might argue it’s near impossible to communicate hurt to your partner. With practice and effort from both of you, you can establish a safe environment for confrontation. Focus on your love for your partner, the need you have and the conversation at hand, and remember to offer a sincere apology when your own mistakes come to light. If you and your partner need help uncovering your emotions and working through conflicts in a connected way, please reach out to us. We are here to help you and your loved one come closer in conflict.